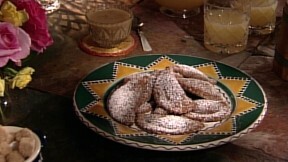 Guest chef Norman Love makes this recipe for rich Banana Chocolate Beignets for Julia Child on her classic cooking show "Baking with Julia". The Beignet Dough: Put milk, water, butter, sugar, cocoa, cinnamon, and salt into a 2-quart saucepan and bring to a boil, stirring frequently until the butter melts. Follow cooking directions below for preparing choux paste. Wrap the dough in plastic and refrigerate until chilled, about 2 hours. Keeping one half the dough in the refrigerator, turn the rest out onto a lightly floured surface and knead in flour a few tablespoons at a time; enough to make the dough easy to roll (about 1/3 cup). It will still be slightly sticky. Wrap and chill before rolling it out. Repeat with the remaining dough. Line 2 baking pans with parchment. On floured surface, lightly roll dough 1/16 to 1/8 inch thick. Cut eighteen 4-inch circles (gather and re-roll the scraps until you have enough). Put circles on baking pans, cover with plastic wrap, and chill for 1 hour. Norman Love made this recipe for choux paste as the filling for his chocolate-cinnamon beignets on Julia Child's classic show "Baking with Julia." Put milk, water, butter, sugar, and salt into a 2-quart saucepan and bring to a full boil, stirring frequently until the butter melts. Stir while adding the flour all at once. Stir without stopping until the flour is thoroughly incorporated. Cook and stir until the dough balls up and a light crust is visible on the bottom of the pan. Scrape dough into a bowl. Immediately beat in five eggs, one at a time, stirring vigorously with a wooden spoon to incorporate each one. After the fifth egg, lift the spoon. If it pulls up some of the choux paste that detaches and forms a slowly bending peak, do not add the last egg. The dough is now ready to be used in any recipe calling for choux paste. In fact, it must be used now, while it is still warm.